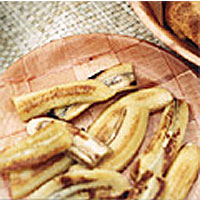 Peel the bananas, cut in half, then split lengthways. Put the butter in a frying pan and heat until foaming. Add the bananas, and fry gently until they brown on one side. Turn and cook for a further minute or two to brown the other side. Serve immediately with chicken Maryland.